This review is part of my commitment to reviewing anthropomorphic literature during Furry Book Month. Arara is the smallest Jegera of her year, constantly bullied for her appearance and desperate to leave her village as soon as the coming of age ceremony is complete. Sels of the flower Kin is a prince without his race's magic powers, travelling towards his last opportunity to choose a sedyu-bonded companion from the newly adult Jegera. It's no surprise that these two outcasts find each other, and their magic bond, nor that the lowly runt turns out to have a vital part to play in the future of both races. But watching the drama play out, and the underdogs have their day, is hugely enjoyable. Some tropes are tropes for a reason. Hundeliebe Publishing, 2014, trade paperback $14.99 (354 pages), ebook $2.99 (99c during October 2016). The two protagonists form an instant friendship, but their different background and outlook means it's not all plain sailing. 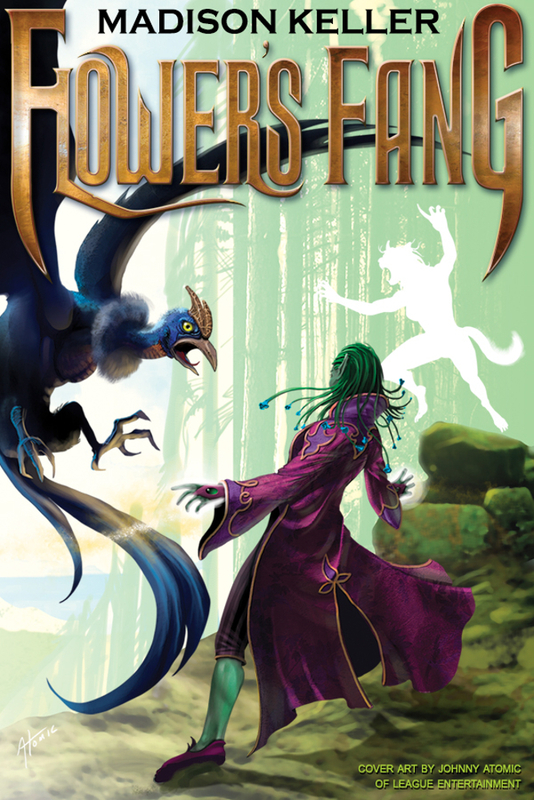 The sometimes uneasy relationship between Sels and Arara as they get to know each other makes Flower's Fang stand out among furry fantasy literature. Many books about Chosen Ones overplay their horrible past and perfect heroism. When that happens, I can't muster a scrap of sympathy for the protagonist, and in extreme cases I hope they'll be run over by a train and die. Arara and Prince Sels, however, are likeable characters, with flaws to round them out. This shades of grey attitude pervades the book, so that nobody is irredeemably bad or flawlessly good, and it makes the experience richer. The world of Flower's Fang is also a big part of the book's appeal. Keller paints the scene with a broad brush and fills in a few key details, so we're not bogged down in description. The two races, the wolflike Jegera and the plant Kin, have delightfully alien physiologies and cultures. The Jegera drop to all fours when they want to move quickly, with clothes and bags designed to accommodate this. They measure time in scratchmarks and space in tails. The Kin need sunlight to give them energy, and root themselves at night. The stakes of the novel are soon raised. From the initial coming of age story, the scene moves to the nation's capital city and a plot against the royal family. But what is Arara's role in it all, and why is she so important? Will she save the day, or destroy it? This book is particularly suitable for older children and younger teens, but can be enjoyed at any age. The ebook version of Flower's Fang is available for 99c during October, as part of Furry Book Month.